Discussion in 'General Indian Domain Name Discussion' started by CyberKing, Aug 29, 2018. I was looking up lists of top IN sales and I see a flaw (do you concur?) 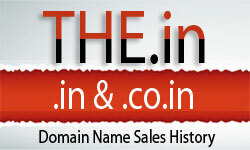 - Unlike COM sales ccTLD sales especially for dot INs listing them on USD price does not give the true picture. Why? Depreciating currency like the Rupee is down over 40 percent since some of the sales have been formally reported! (INR 40- 1 USD) With the Rupee seemingly heading towards 75-80 levels according to some experts we are looking at a 100% difference In Rupee terms of the sale price since 2007. So in my view the Top 10 IN sales list as it exists is flawed! You make a good point, but many (most?) .in sales seem to be in USD. Thanks @Jeff ...Yes feeling on top given its a highest on record IN sale even in USD terms (including all fees/costs). Yes most platform based sales (Sedo, GD, NameJet) are completed in USD followed by EUR or GBP however it becomes interesting when viewed from an INR or constant currency perspective. In the process I reviewed the top 25 reported IN sales and its really sad that barely 2 legitimate IN sites are in full operation having paid upwards of 10K USD for each name. 2-3 redirect to their COMs and some despite having paid to secure their brand have NOT even bothered to redirect it to the COM site. Some of the sales seem like a sham just to get on some list. This review was really disappointing showing how COM simply dominates ccTLDs. The depreciating rupee also means .in sellers from India are making MORE money these days for their ,in sales in USD.